Cords everywhere? Don't know if you're like me, but there seem to be cords all over our place and sometimes they drive me a bit bonkers. So often it's the little, silly things that trigger us. 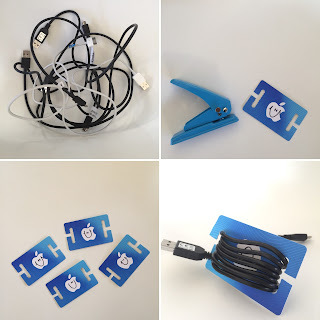 In my efforts to reuse, repurpose, recycle and clear up our iPod, iPhone, iPad, Kindle, DS, headphone, whatever cords etc, I decided that used gift cards would make perfect cord cards, with just a few tweaks. In my enthusiasm I forgot to take a 'before' photo, but you get the idea. All it took was some old gift cards, a hole punch, scissors and a few minutes of my time. Voila! p.p.s. afterwards I wrote the name of the cord / device on the card with a permanent marker.